Within Hindu religion Salagrama is considered the most holy spot connected to the Gandaki River and the veneration of Salagrama stones. Various Hindu schools have different opinions regarding the exact location of the spot, but all agree Salagrama is connected to the Gandaki River, just a few hours walking from Muktinath-Chumig Gyatsa. On this page two maps locating Salagrama on different spots. The course of the Gandaki on both maps does not correspond with the actual course, but it is clear that according to the map below Salagrama is at the source of the Gandaki River just near the boarder with Tibet,** while the map above locates Salagrama about 60-70 miles below the source of the Gandaki. 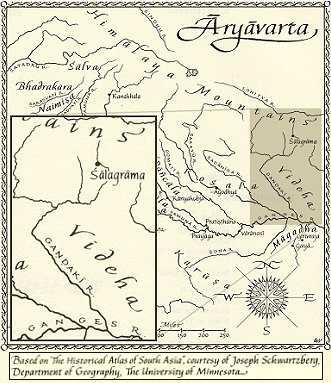 Both maps connect Salagrama with the Gandaki River as can be found in the Purana legends. See also Tirtha-pratyamnayah. 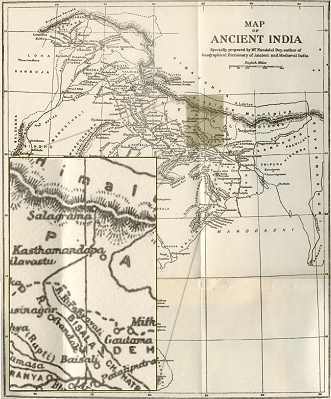 ** In his book Mustang, A Lost Tibetan Kingdom (Book Faith India, Delhi-1992) author Michel Peissel mentions on page 215 he visited the source of the Gandaki River. He located the source near the boarder of Tibet at the village Namdrol, in Mustang, Nepal.